One day you'll be able to download yourself onto a device like this. Chord, renowned for their ultra-sleek, ultra-tech hifi have announced their new high-definition multimedia server, the Media Engine. The Media Engine has the ability to play DVDs and CDs to an incredible standard. It has 2.4 terabytes of storage (1 terabyte = 1000 gigabytes)creating capacity for hundreds of films and the largest of music collections stored totally uncompressed. An entire music and film collection acessible within seconds via on screen displays, creating a virtual library with 1080P resolution potential. 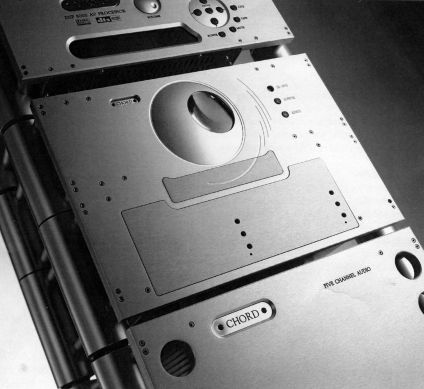 Designed using the most modular architecture possible, Chord have ensured clear upgrade paths for the next generation of DVD and audio formats. One can network this device to provide almost unlimited storage capacity. Using some of the best image processing technology available the system gives you the flexibility to adjust the video output to match both the native resolution and refresh rates of your chosen display. The media engine provides powerful images that surpass that of high end DVD players and can also be used as a video scaler for external video sources. DVI-D connectivity ensures that the image stays in the digital domain and retains optimum clarity. With 2.4 terabytes of hard drive space, the Chord electronics media engine is capable of storing up to 600 hours of high resolution film. For the audio purist side of its performance it uses studio quality output stages via either single-ended or balanced analogue outputs to contribute towards the Media Engine having an audio clarity found only in the best high end CD transports.